Au cours d’un article extraordinaire sur la catastrophe de la tour Grenfell, Andrew O’Hagan pointe un véritable scandale médiatique. 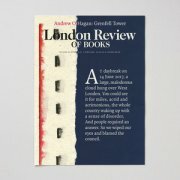 (Ma traduction de la couverture du London Review of Books). At daybreak on 14 June 2017, a large, malodorous cloud hung over West London. You could see it for miles, acrid and acrimonious, the whole country waking up with a sense of disorder. And people required an answer. So we wiped our eyes and blamed the council.